Most of the settings which QGIS offers are directly supported by QField without any extra effort. All style settings from QGIS are directly supported by QField. This includes all renderer types like graduated, categorized, rule based, 2.5D as well as data defined symbology. In QField, objects are identified with a name. The expression to generate this name can be defined by opening the attribute table in QGIS and switching to the form view. Choose the appropriate field or an expression in the list there. 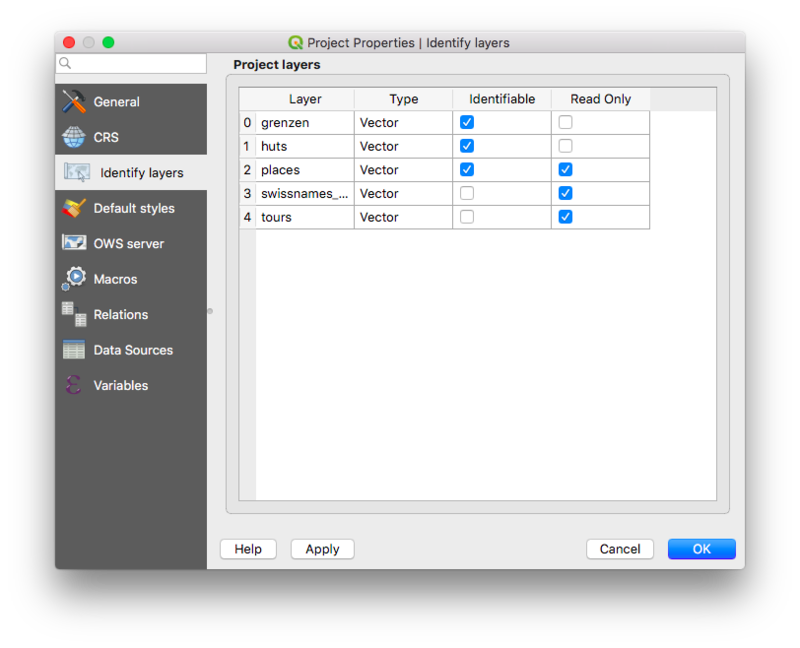 Starting from QGIS 3, this can be done directly from the Vector Layer Properties ‣ Display page. The display expression is also used to search in layers. The display expression will be used to represent features with an identification string throughout QField. Some layers in a project are just there for pure visual purpose. Such layers should not show up when a user taps somewhere to identify objects. Some other layers serve as source of information and shouldn’t be modified by the user. 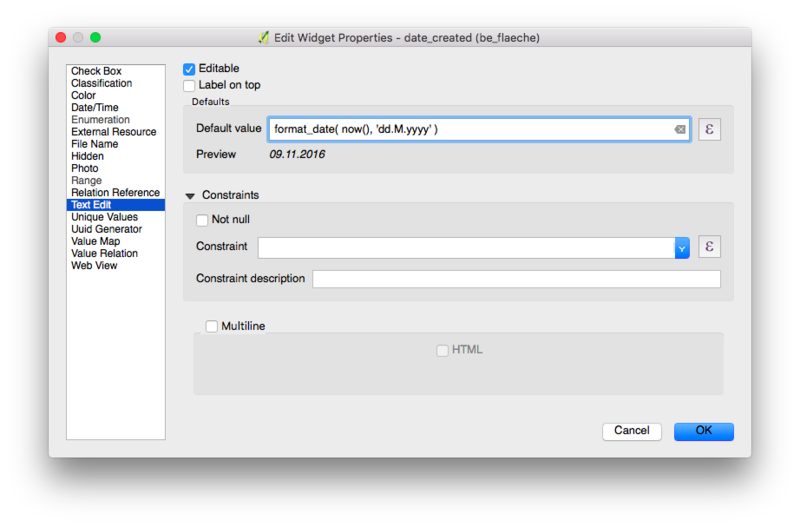 It is possible to protect layers from editing attributes or adding and deleting features. It is also possible to configure which layers are searchable. To configure identify, readonly and searchable behavior, go to the Project ‣ Project Properties ‣ Identify Layers page and activate the checkboxes to match your desired behavior. Configuration of layers that will not be identifiable, not modifiable and/or not searchable. QField creates forms similar to, but not equal to QGIS. The setting suppress feature form is directly applied to the QField form. The field widgets from QGIS are supported on a best effort basis. Numerical input is enforced based on the type. Groups and Tabs from Drag and Drop designer forms are supported. Groups can be hidden based on an expression. This is useful when certain attributes are only required under certain conditions. As an example imagine mapping trees. Some of them might have a disease and you have a list of possible deseases. To not clutter the form with many fields, make a group and configure a visibility expression for a group “diseases”. Add a field “desease” with a checkbox. Only when the checkbox is checked, the list of diseases will be available to the user. 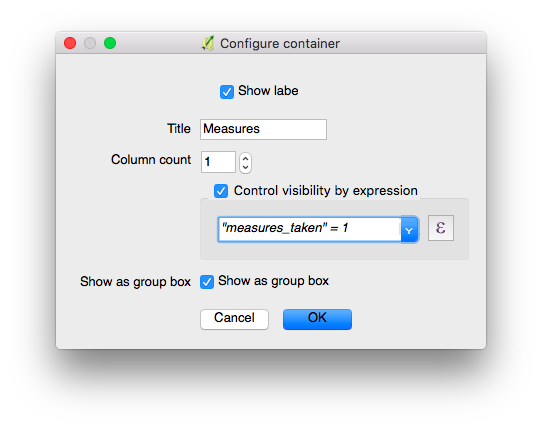 Configuration of a group box that will only be shown if the checkbox “measures_taken” is checked. 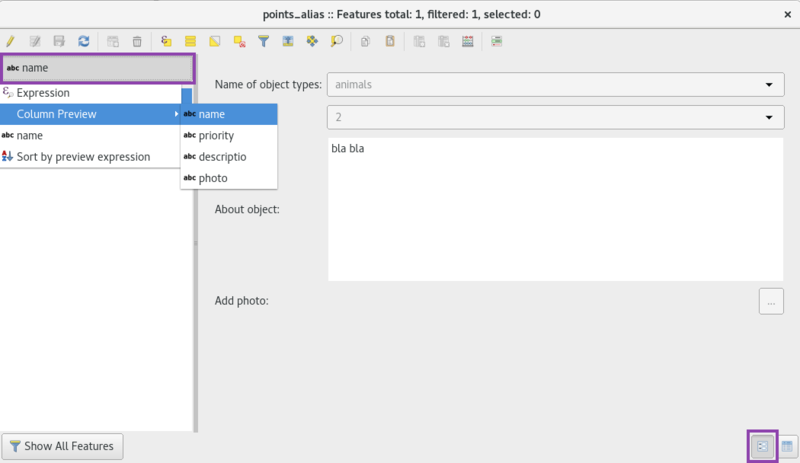 Attribute fields can have constraints attached. Constraints are expressions that needs to evaluate to True (or 1) in order to be able to save the form. Constraints are configured on a per-field basis and a description can be added that will be shown to the user if a constraint is not satisfied. You cannot enter an elevation value higher than the highest mountain in this country. It is required to fill in an identifier. Fields can have default values configured. Default values are inserted into the attribute form when digitizing a new feature. They are visible to the user and can be modified as long as the field is editable. They can be based on the geometry or expression variables. In QField, there are some additional variables available regarding the current positioning information. position_coordinate (Geometry in WGS84!) : Lon, Lat, Altitude as delivered by the sensor. Is also available when the crosshair is not snapped to the sensor. position_direction (float) : Direction in degrees from true north. position_ground_speed (float) : Groundspeed in meters / second. position_magnetic_variation (float) : The angle between the horizontal component of the magnetic field and true north, in degrees. Also known as magnetic declination. A positive value indicates a clockwise direction from true north and a negative value indicates a counter-clockwise direction. position_horizontal_accuracy (float) : The horizontal accuracy of the coordinate (in meters). position_vertical_accuracy (float) : The vertical accuracy of the coordinate (in meters). position_vertical_speed (float) : The value of the vertical speed in meters per second. Configure global variables on the device and insert them. The editable flag of fields is respected. QField offers a much more fine-grained control over the last used values and ignores the QGIS setting. While digitizing new features, new points can be snapped to existing geometries. All configuration can be done in Project ‣ Snapping Settings (Settings ‣ Snapping Settings in QGIS 2.x). It is also possible to only snap to one or a few layers. The snapping tolerance can be specified in map units or pixels. In almost any case, the units should be set to pixels. We made good experiences with a tolerance value of 20.